I have read that if you go too large they handle like s###e. Just like that guy said. Larger tires may look nice, but larger tires affect your handling quite a bit. 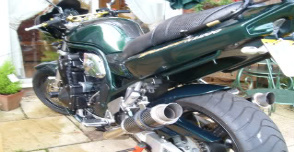 You can do the back but the front would be bad, you can always put 1200 forks and swingarm on it, job done then. putting different tyres on your rims will knacker the handling entirely, if you must have bigger tyres, which is purely for looks and not riding ability, change the wheels!